A fall tradition at Adrians Boutique! This little packet contains A LOT of flavor! Mix powdered sugar with the softened cream cheese. Stir in pumpkin and spices. Refrigerate at least one hour. Serve with gingersnaps, vanilla wafers, or apple slices. Many more recipes included on packet. 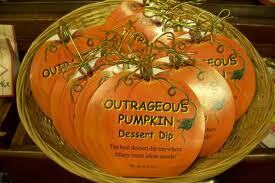 Outrageous Pumpkin Dessert Dip Mix is available at Adrians during the fall season.